The Stuarts: Political Propaganda or Lack of Focus? Recently BBC Two aired a documentary series entitled The Stuarts. First airing on BBC Two Scotland back in January and February, the series which was presented by Dr Clare Jackson is meant to explore the lives of the Stuart monarchs who ruled over the United Kingdom. 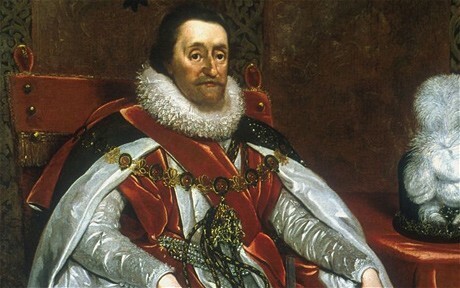 The initial programme dealt with the first Stuart King of England, James I and that is the subject of this article. While Clare Jackson does present well and the programme is well made there is something that is lacking from it. The thing that is lacking could possibly be a form of political propaganda or a lack of focus by the production team. It seems hard to tell at times. While Dr Jackson does give a good picture of James I, it is an incomplete picture. There does seem to be a bit of hero worshiping in Jackson’s portrayal of James and certainly his personal history is edited to fit Jackson’s personal view of him. James is portrayed with his bad sides such as his rather badly handled treatment of his second son and eventual heir, Charles and his planting of English colonials in place of the Irish aristocracy. But the majority of the criticisms levelled against James are strangely ignored. For instance, Jackson repeatedly mentions James work as an author. However, Jackson plumps to look at one of James’s lesser known and much safer books, The True Law of Free Monarchies instead of his more famous and more controversial book; Daemonologie. Daemonologie was James’s guide to how to find out about witches and how to then execute them. James had since a near death on the high seas been interested in witchcraft. In fact, the capture and murder of many innocent people purported to be witches was something of a great pastime for him. Yet in The Stuarts this isn’t mentioned. Why? If Jackson is supposed to give us a detailed look at monarchs who are often overlooked then why not examine one of James great pastimes? Apollo with his songs / debauched young Hyacinthus/ Just as Corydon f**ked Amyntas/So Caesar did not spurn boys/One man f**ks Monsieur le Grand de Bellegarde /Another f**ks the Comte de Tonnerre/ And it is well known that the king of England / f**ks the Duke of Buckingham. Quite. Even more evidence was discovered recently at Apethorpe Hall when a secret passage was discovered between the bedrooms of James I and Buckingham’s bedrooms. Yet Jackson ignores the incredible body of evidence that James was gay or at the very least bi sexual. Why? Even in a programme that can only spend a certain amount of time on each monarch surely this would be a new angle to go at. TV documentaries haven’t always looked at James’s homosexuality but it has been mentioned previously. Surely Jackson could have taken some time out of the bits on the Irish planting to look at it? When Buckingham is involved in a big way in the story of how Prince Charles went over to Spain to seek his Spanish infant, Buckingham is rather strangely referred to as “an advisor”. Buckingham due to his closeness to the King had much more significance than simply being an advisor, yet he is not even mentioned by name. Something that is, rather interestingly left in unlike Daemonologie and Buckingham is James wanted to unite Britain. James’ greatest ambition aside from murdering all those witches was to create peace throughout the land. He didn’t want all the terrible, isolated, vindictive foreign policy left over from Elizabeth’s reign. It was ironically this same foreign policy which had made England such a wealthy nation. However James wasn’t a great fighter, he wanted peace between England and Scotland and with the rest of Europe. To start off with he got to marrying his children off to foreign royals, something which hadn’t happened since Henry VII’s daughter, Queen Mary had married the King of Spain. But James main plan to unite his realms was to make England and Scotland part of the same country, in other words to unite them as one Kingdom. – a United Kingdom that he would rule over. Jackson puts full welly behind showing this side of James off. Could this perhaps have something to do with the situation in Scotland at the moment? Don’t forget this was first shown on BBC Scotland and I had been told it might not be repeated for the rest of England. Could it be possible that Jackson’s polishing up of the monarch who invented the union now so despised by the likes of Alex Salmond could be an attempt to swing voters who might not be decided to go towards voting No for independence? Either way what Jackson has left out is almost as telling as what she had left in.